You are here: Home / Methods / Chart Pattern Trading: Which Timeframe Is Best? Chart pattern trading and time frames go together. If you use chart patterns and are connected to the technical trading world, then you’ve likely wondered about time frames. This list could go on forever. Just imagine replacing the options in this list with every number you can think of, and that’s the range of available trading charts intervals and combinations. But which one is the best for chart pattern trading? For that matter, which one is the best for trading as a whole? These are great questions to ask. Timeframe selection can be more complicated than this, but not by much. What most traders are well served to remember is that all charts are simply a form of visual analysis. Every chart that you encounter consists of the same data. The difference lies in the way it’s summarized into different timeframes on the chart. In chart pattern trading, you choose a timeframe and then apply your pattern analysis. In this article, we’ll explore three examples of chart pattern trading techniques applied to different timeframes. 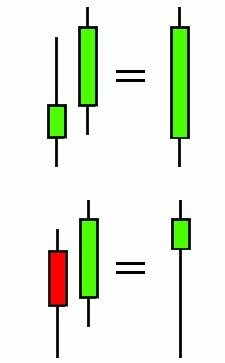 In scenario one, we’ll make the first two candles in each set 5-minute candlesticks. Adding them together produces a single 10-minute candlestick. In scenario two, we’ll make the first two candles in each set 1-hour candlesticks. Adding them together produces a single 2-hour candlestick. So what’s the difference between these two scenarios? The main difference is only in the granularity of the data. Higher intraday timeframes like the 1-hour chart have less granularity and detail. Lower timeframes have more. Some traders see this lack of granularity and detail of higher timeframes to be negative. I agree with that in certain circumstances when the details are a necessary part of the strategy. However, in most cases simplicity is a strength. You can use this simplicity to benefit your chart pattern trading. For example, consider using a higher intraday timeframe for your entry strategies. Your entry criteria could be that an instrument has to show strength by hitting three consecutive higher highs in the 1-hour chart. Look for three consecutive higher highs within a half hour of trading. On a ten minute chart, this scenario looks like the above image. 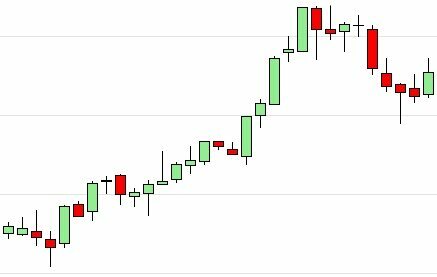 These candlesticks show three consecutive higher highs. Each bar is ten minutes, so three bars together represent a half hour of trading. Let’s say we want to use a similar strategy to that in Example #2. We want to follow the chart pattern trading strategy of looking for three consecutive higher highs within a half hour of trading. The image above shows this scenario on a one minute chart. Every 10 bars, new highs form for three consecutive ten minute periods. Chart patterns reflect the collective psychology of all market participants. All timeframes are valid. And all valid chart patterns can be applied to all timeframes. However, the more time represented in a given bar on the chart, the more market sentiment it reflects. This means that the moves in higher timeframe charts often last longer. This is important to consider when choosing what intraday timeframe you will trade. When you trade in the 30-minutes and over timeframes, you can have more confidence that the patterns you identify will lead to strong, long-lasting market moves. Make sure you look for the best timeframe to suit your trading style. And consider using one of the higher intraday timeframes for more perspective. Do you know someone wanting to improve their chart pattern trading? Share this post using the buttons below!